Mechanization of rock drilling started during the industrial revolution, with the desire to increase production and reduce the danger associated with the hand methods. Mechanical drills were used to bore holes into rock for the purpose of inserting dynamite and blowing up the rock into smaller more manageable sized pieces known as muck. The muck was then removed from the shaft and if it contained ore, was processed to remove the valuable minerals. Some of the earliest mechanical drills were called “post drills” . Post drills were compressed-air powered drills that were mounted to large steel posts located at the face of the mine workings. These noisy tools were also known as “widow makers” because they rarely used water in the drilling process. High concentrations of finely-ground stone dust produced by these drills and poor ventilation were hazardous. Repeated breathing exposure led to a deadly condition known as “silicosis”. This condition took the lives of many men working underground. 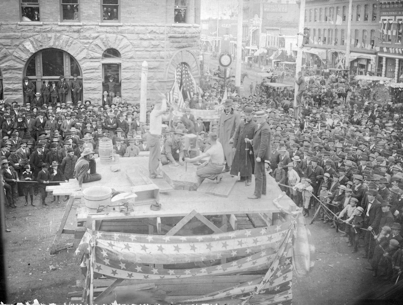 Contests developed shortly after the industrial acceptance of these drills. We currently have limited documentation of these post drill contests, aside from the picture shown to the side. Any additional information would be appreciated. The “Jackleg drill” refers to the Model 83 Gardener Denver drill. This is the standard drill used in todays mining competitions. 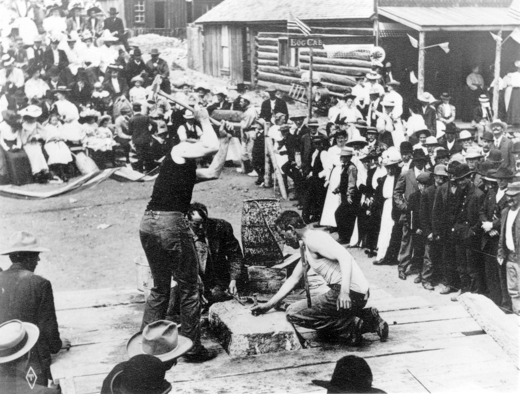 The “jack” in jackleg came from the use of the term jack to describe any immigrant miner from Cornwall, England. These highly skilled men dominated the hard rock workforce of the era. “Leg” in jackleg, referred to a compressed-air cylinder that is used to change the elevation of the drill and apply pressure against the rock. Jackleg drills are still used in todays mining processes. However, jackleg drills have largely been replaced with larger, more mechanized drill jumbos. “Jumbos” as they are called, are driver operated machines with multiple drill armatures that are mostly automated. 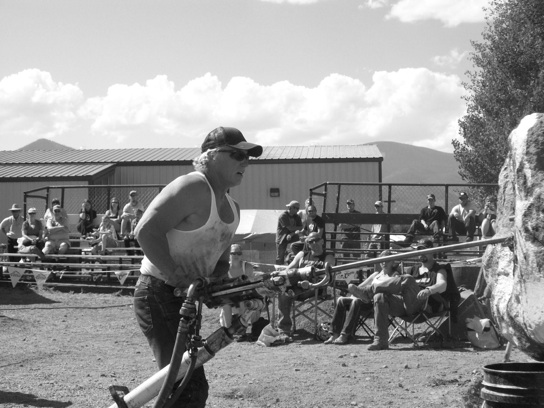 The competition is a timed event where the driller with the fastest time wins. Contest rules may vary depending upon where the event is held. However, the following is an explanation of the rules used in most Colorado competitions. Two large boulders are placed and painted on the competition grounds. Multiple 2.5” diameter circles are painted in a grid pattern on both rock faces, and are numbered in sequence. The 2nd rock is painted with the reverse number sequence. Contestants draw numbers from a hat that denote the number of the hole that they have to drill. In theory, the reverse numbering usually means contestants will have a “high” and “low” hole on each rock. “High, Low” refers to the elevation of the holes on the rock face. Contestants are generally given 3min to locate the desired position of the drill on both rocks before their time starts. Contestants start behind a line that is 15ft away from the rock face. The drill is resting on cribbing in such a fashion that it makes for easy insertion of the drill steel. When the judge says “Go!” their time starts. Contestants insert the 3ft, 1 5/8” diameter drill steel into the drill chuck, pick up the 125lb apparatus and cradle it up to the rock. They then stab the leg into the ground, and place the drill bit against the rock. 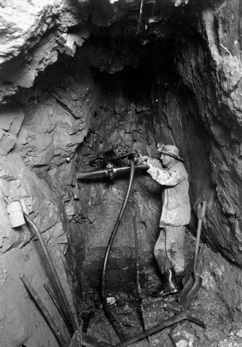 In the next step, referred to as “collaring”, the driller has to start the hole within the confines of their numbered circle. If the face judge finds that the hole was drilled outside the confines of the circle, the contestant is disqualified. The driller then proceeds to drill the entire 3ft steel into the rock. The face judge taps them on the shoulder once the chuck tender taps the rock face, denoting the hole has been drilled, and the driller can relocate the drill to the other rock and repeat the process. Once the driller successfully drills two holes, they cradle carry the jackleg across the line and set it down. Their time ends once the steel is out of the chuck, and the drill is resting on the ground. Contestants may also be disqualified for drilling into other holes, or, abusive handling of the drill. The Team JackLeg is a timed contest with 2-3 drillers depending upon where the contest is held. Each man on the team must drill one hole within a confined rectangular box. Drilling into other holes or outside the box disqualifies the team. In the three-man contests, the 1st man’s position is known as the “collar”. He tries to collar all three holes inside the rectangle, drilling the 3rd hole all the way to the chuck tender. The collar then leaves the drill inside the hole, runs behind the line, where the 2nd man gets tapped in. The 2nd man’s position is known as the “rocking chair”. His only job is to pull out the drill, and reinsert it into the previously collared hole and drill it down. After the 2nd hole is drilled, the rocking chair leaves the drill in the hole and runs across the line, which is when the 3rd driller is allowed to step in. The 3rd man’s position is known as “clean-up”. His job is to drill the remaining hole down, remove the drill from the rock, carry it across the finish line, remove the steel, and set the drill down. 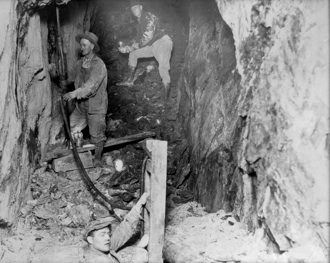 Miners working underground with mechanical drills.